From the beginning of our business in 1999, we have focused on outdoor Christmas decor.We found that there wasn’t a good selection of large, high quality and durable outdoor figures such as Santa, Snowmen, Toy Soldiers, Nutcrackers, Reindeer,and particularly Nativities and Creche scenes.We have greatly expanded the available selection of these products and our customers have expressed their appreciation. Recently, it became apparent that there was a need and demand for indoor Christmas figures that went beyond the traditional “trim a tree” selection of lights, baubles, tinsel, tree skirts, tree stands and Christmas stockings. so we decided to create the category of indoor Christmas decor. We began last year by offering a limited selection of beautiful, large resin and fabric Nativity figures made by one of our factories. These sold well and we have expanded the Nativities to include plush animals and new Nativity figures such as Shepherds and Angels. In addition we have designed a wonderful new Caroling Family, with a 52in Father and Mother and a 44in daughter and 42in son. Complementing this family are two resin and fabric Santa and , just for fun, two Jesters. More on our new items next week. A great benefit in dealing directly with overseas factories is that we can design and build new products which we can then offer exclusively. This means that when we experience significant customer interest in a large nutcracker, for example, we can come up with new larger size or different look and expand our business while satisfying customer desires. We have created a number of new pieces for our Life Size Nativity Set. We have also created two new six and one half foot (78in) Nutcracker Kings which arrive in early June. This is the time of year when we have visited all our factories, approved all our new designs and placed most of our orders. We have been waiting impatiently for our first shipping containers to arrive so we can start shipping our many advance orders for Nativity Sets both indoor and outdoor.Many churches, municipalities and businesses order early to ensure they get their set, because of budget timing or because they were too late deciding last year and we were sold out. We are very excited about showing our best selling Life Size Nativity with a new King and new larger Ox and Donkey and Lambs. Our Life Size African American Nativity has several new figures including a black Gloria Angel and Black Shepherd and is now 12 piece. We have designed and made a new five foot Toy Soldier and we have a Nutcracker King coming in a month or so. My last blogpost told the story of Betty Wetmore of Columbia MO and her Santa, Sleigh and Reindeer display stolen before last Christmas. Although the police recovered her display, it was broken and she and her husband experienced a lot of stress. Every year, during the Christmas season, we are contacted by customers who have had a lamb or the baby Jesus stolen from their Nativity set, or a Nutcracker or Toy Soldier spirited away and if recovered, in poor condition. We recognize that a determined thief will eventually overcome the best security but we have some suggestions for securing your outdoor Christmas decorations that will make successful disappearance less likely. If setting up the display on a wood surface, such as a stable for a Nativity set, screw or glue the figures to the wood surface. For smaller figures, such as Nativity animals or the baby Jesus, tether them in two places to wood pegs using clear fishing line. Some of our larger figures have attachment brackets built in to the structure. These can be used to attach the figure to the wall behind for items such as Toy Soldiers or Nutcrackers displayed on each side of a door or to a floor or ground for such displays as Nativities. Bare ground attachments can be disguised using mulch or other ground cover. Please note that these attachment methods can be used to prevent taller pieces falling onto hard ground or walkways and being damaged. Causes can be high winds or vandalism. We were presented with first approval pieces of a new King, Ox and Donkey for the 54″ Life Size Nativity and we had the fun of adding final decorative touches to these items We had the fun of approving the new sleigh and finding a Santa for the new Santa and sleigh set and the wonderful new Nutcracker King items 37005 and 37006 which will please a lot of people. Our approach to direct marketing to consumers is to offer a certain number of new products each year and to continue to listen to our customers regarding improvements to existing sets and items. I think we are doing this and sales seem to indicate that it is appreciated. We will continue to update you on these developments. We expect to start receiving replenishment stock and new item in shipments arriving May 15 and continuing through the summer. My last blog exulted that the bulk of our import containers from Asia had finally arrived after many unusual and unexpected delays. Well,obviously, many customers were waiting to hear that and orders started coming in immediately. We were able to begin our on-line advertising campaign last week and our first customer newsletter went out today. The gratifying result has been many more calls and orders. The Giant Life Size Nativity sets, 15 piece and 12 piece, are very popular and we have already re-ordered from our factory. Our large lighted frame figures and scenes are doing very well and the new Nutcrackers and Toy Soldiers that we introduced this year are attracting great interest and sales. Both categories are trending ahead of past years. Customer service has spoken to several people who create large outdoor displays at Christmas and who want to add several of our new figures. One lady said she had invested a half million dollars in her display so far. No recession for these folks! We value our relationship with collectors and that is one reason we design and build new items each year. The other reason is that in retail, which we are on the internet, “you are only as good as your newest product” and that is what keeps us going. We have a great designer( our president) and skilled and efficient factories, plus great staff providing superior customer service. All in all, a good combination. I just returned from a stimulating visit to one of our few factories making Christmas decorations in the USA. This factory, located in a small town north of Tulsa, Oklahoma is a testament to American ingenuity and fortitude. 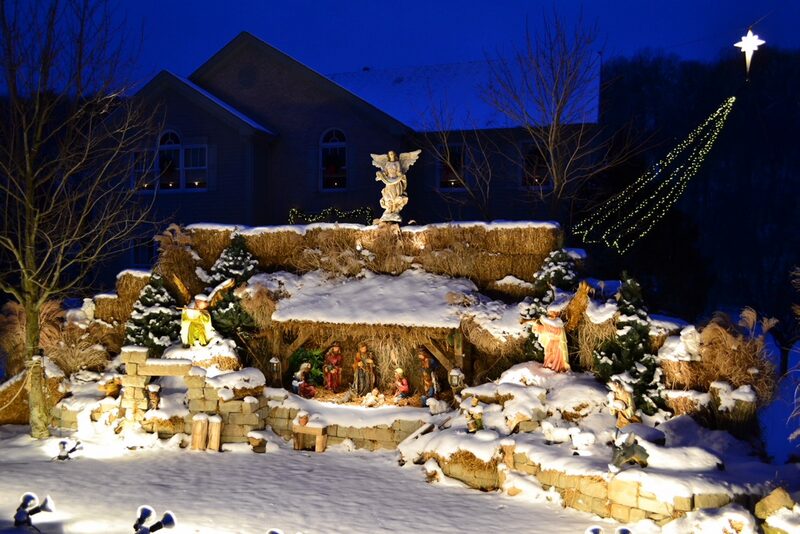 They make a variety of outdoor lighted frames depicting the traditional Christmas figures, including The Nativity, Santas , Snowmen, Toy Soldiers, Nutcrackers, Reindeer, Elves, etc. Well there is a lot of this product in the US market, mostly made in China, but also in Mexico. The imported product is lighter weight, less durable but cheaper and tempts retailers who try a container load but rarely repeat their order the following year. In fact, some of this imported product ends up at the American factory for rework, so it can be finally sold. Why is the American product better? At first glance, it doesn’t look to be made differently, with most of the fabrication and assembly work done by hand. If you look more closely at the US made product, you see heavier gauge steel and aluminum frames and accessories, you see separate clips and extra ties to attach the light sets to the frames and you see much closer spacing of lights in the set. What you don’t see is the incredible attention to detail, both in the planning of the process but also the control of the production and the raw material, semi finished and finished product. What you don’t see is the weekly “Quality Competition” where production colleagues check 55 separate quality items on randomly chosen product and only 100% perfect wins.